Michelle Lorna Nahanee is an Indigenous innovator and change-maker from the Squamish Nation. She grew up in Eslha7an, and then East Vancouver, and works within the intersection of class, race, culture and creativity. She is the founder of decolonizingpractices.org and the designer of a life-size board game and workshop called Sínulhkay and Ladders. 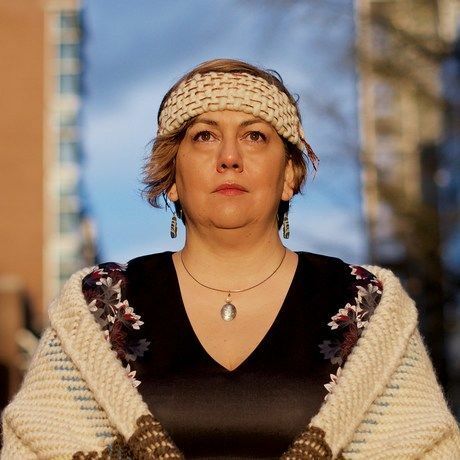 As a communications consultant and graphic artist, Michelle has worked on social justice projects for First Nations organizations across Canada and also within her own Nation. From health promotion to gender equity, Michelle’s collaborations have influenced opinions, changed behaviours and mobilized community action. She is a supportive leader who is most comfortable behind the scenes—contributing to projects that improve First Nations realities for the last 20 years. Michelle recently completed a Master of Arts in Communication from Simon Fraser University where she wrote “Decolonizing Identity: Indian Girl to Sḵwx̱wú7mesh Matriarch.” She concluded her research with a call to dismantle academic barriers to decolonizing practices. Michelle is also the Board Chair of Kwi Awt Stelmexw, a Squamish arts and education organization. How do you define creativity and apply it in your life and career? Creativity, for me, is a divine act of moving forward and reaching backward, while staying peacefully still. It is a perfect state where I can see what needs to be done. My work is grounded in my Indigeneity so we have care for future generations while also listening to our ancestors. At my best, I’m connected to and supported by that love, and, at my worst, I’m struggling to get back to that space. I take really good care of my creativity, I’m protective of my peace. And, I am also grateful for what it has given my family and me. Where do you find your best creative inspiration or energy? I find my best creative inspiration laughing with my family. When I am home at my uncle’s for a big salmon dinner, I’m surrounded by ancient art and songs and the funniest people I know. We often joke about the Nahanee achievement awards because we’re all deeply engaged in creative projects. Some would label the work social impact, but for us caring about our impact on community is a Squamish way. What’s one piece of creative advice or a tip you wish you’d known as a young person? I would have liked to know that Indigenous people are not less-than, that our culture and ideas are powerful and valuable and that our struggles are colonial impacts NOT pathology. How many creative ideas are we missing from othered young people because of supremacy? What are you proudest of in your life? Professionally, I am really proud of my contribution to the field of Indigenous design and communications. I have worked on many social justice files, as well as corporate branding, that has contributed to dominant narrative shifts. I’ve been able to stay connected to the strength of my ancestry while supporting organizations to look great. It’s called Indigenous visual sovereignty—when we express who we are however we want to express that. It’s the opposite of being constructed.